From the outside, it can be hard to tell where to stay in Cairo, especially if you’re planning on staying for more than a week. 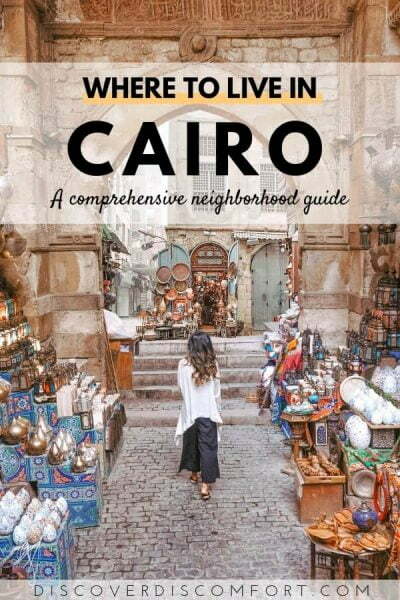 We didn’t find a guide to neighbourhoods in Cairo online and so decided to write one. As we are spending a couple of months in Cairo to learn spoken Egyptian Arabic (click on this link to see our learning mission) properly, we want to make sure we’re living somewhere we like. A little bit about Cairo first, to give you an idea of the size of the problem. Cairo is the second largest city in Africa, with a population of almost 20M, with around half of it in “informal” (or “extra-legal”) housing. It’s also an ancient city, and has been continuously inhabited for around four thousand years. This bears repeating. Four thousand years! And that number is a conservative estimate. The crazier thing is that the Pyramids of Giza, adjacent to which the city has been built, have existed for even longer. Needless to say, no matter how good the urban planning was in 2,000 BC, a lot has changed since then. The city is sprawling and the public infrastructure never kept up with population growth, resulting in dense congestion that can make it a headache to move from one part of the city to another. In an attempt to deal with the growth, new cities have sprung up just outside Cairo, like 6th of October and New Cairo City. These were designed to be modern and slick — in contrast with Downtown Cairo — but history has caught up with them too and they can be as hectic as everywhere else. See also: The many sounds of Cairo, an explanation and audio guide to the ridiculous noise you’ll hear in Cairo. Traffic, the Call to Prayer and people yelling Bikya explained. Picking the right neighbourhood is important for a number of reasons. Some of the reasons are unique to Cairo. Firstly, traffic in Cairo is near apocalyptic, so you want to pick somewhere you want to stay. The public transport options are complicated and not that fast. It’s hard getting around and can take 30 minutes to just go to an adjacent area (like Dokki to Zamalek). A motorcycle taxi using Uber is probably the quickest option, but is definitely not the safest. Yes, many have survived, but generally if we’re on two wheels, we prefer to be the pilots. Not to mention have all the right gear, and preferably do it away from traffic. Almost nobody in Cairo wears a helmet, not the rider, and definitely not the poor passenger. Secondly, we don’t want to travel far for life necessities. For us, those necessities in a neighbourhood are food, home services (like laundry) and fitness. Being able to walk to a market, get good quality sandwiches nearby and be able to hit the gym or a park when we need is mandatory. Thirdly, we want to live local. We’re in Cairo and Egypt to learn Arabic. There’s no point living among expats (where even local restaurant staff will greet you with “hello” and hand you an English menu) or in the middle of nowhere with nothing but pyramids and camels (which might be amazing for a holiday, mind you). We want to live with people who speak it, and in a neighbourhood where we’ll be encouraged to speak it. Finally, we want fast internet. Where you live can influence how fast the internet is. 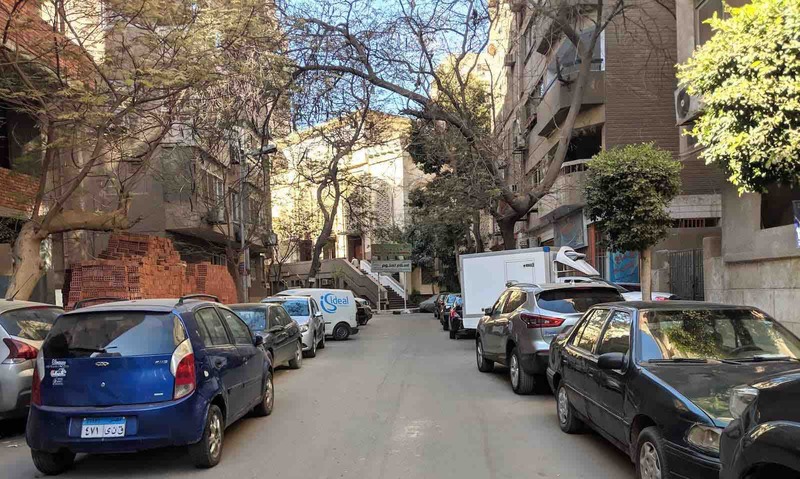 In Cairo the speed varies dramatically, so we want to make sure we’re in a fairly developed neighbourhood, one where high-end internet connections (whether wired or wireless) are at least an option. When you hear about Cairo neighbourhoods you often are just given a list of meaningless names. Let’s try to put them into geographic context. There are two kinds of neighbourhood: Central Cairo, and cities that are part of Greater Cairo. Central Cairo: The Central Cairo neighbourhoods are dense, old and close to the action. These include: Zamalek, Maadi, upper Giza (including Dokki and Mohandesin) and Downtown. Old/Coptic Cairo and Islamic Cairo are also inner city, but people don’t usually stay there (there are almost no accommodation options, except maybe the occasional dodgy hostel). 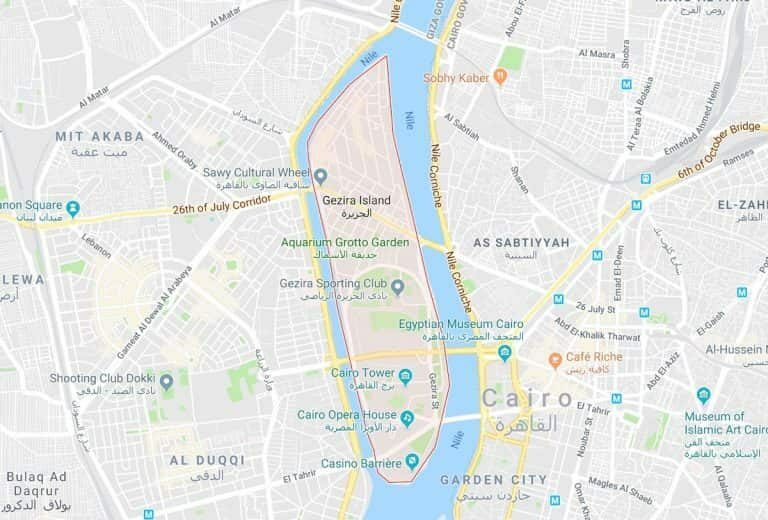 Greater Cairo: New developments are outside Cairo proper, but form part of Greater Cairo. They include Nasr City, 6th of October City, Heliopolis and New Cairo City. 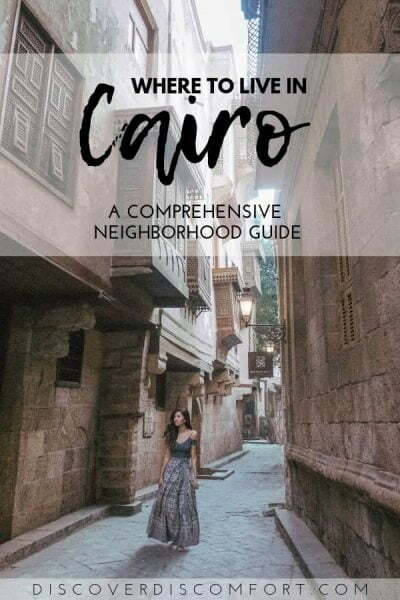 We’ve been walking around some neighbourhoods, in addition to poring over blogs, maps and guide books to figure out where the best places are to live in Cairo. There’s something different for everyone. 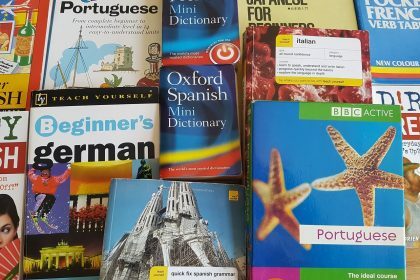 Picking the “best” neighbourhood depends vastly on whether you want to speak Arabic, whether you have kids, how long you’re in town for and what you consider good “lifestyle” to be. We chose to spend our Cairo time in Dokki, also visiting nearby Mohandesin. Actually the exact definition of each is hazy (they’re not formally delineated), but you know when you’re in the middle of each one. Dokki is a residential area on the west bank of the Nile, just south of Mohandesin. It was built in the 60s and 70s for Egypt’s then-emerging professional classes. It’s a little cheaper than its northern neighbour (which is within walking distance), and also quieter. It has a great local fruit and vegetable market on Soliman Gohar St, a cinema and a metro station. Dokki. Buildings are good. Lots of cars on the street, double parked. Dokki is a somewhat gentrified but still cool area. The apartments in which we’ve stayed have been well-equipped and belonged to the kind of family that had multiple apartments, all furnished. There are also a few embassies in the area, including those of Singapore, Malaysia, Belarus, Korea and Pakistan, and some schools serving those communities. While Dokki itself is safe, it’s near some poorer parts of the city, including slums like Sudan Nest, west of the area, near the train tracks (see here for a good pictorial review from Reuters). That’s not a bad thing, just a reminder of the wealth/poverty gap that is apparent in all major industrialised cities. You can totally avoid them for your entire stay without even trying, mostly because it’s never fun playing the game of “Frogger” crossing a main road. Dokki has lots of small shops, some boutiques, a few big chains (Burger King, H&M) and there are a few decent bars and restaurants. You can rent a two-bedroom apartment here for around USD$300-500 a month, and a short-term double room in an AirBnB goes for about $15-30 a night. Mohandesin was also built in the 1960s and 70s for Egypt’s emerging professional class. The name means Engineers, and yes, it was originally intended as a residential neighbourhood for engineers (I don’t know why they need to be separated, and prefer to imagine it’s because of engineers’ curious social habits, like obsessing over clean code and life-hacking techniques). It’s right above Dokki (technically Dokki is part of “greater Mohandesin”) and quite similar in vibe, but slightly more industrial and slightly more expensive. Like Dokki, it’s home to a few embassies and has accoutrements for western expats, like foreign supermarkets and fast food joints. 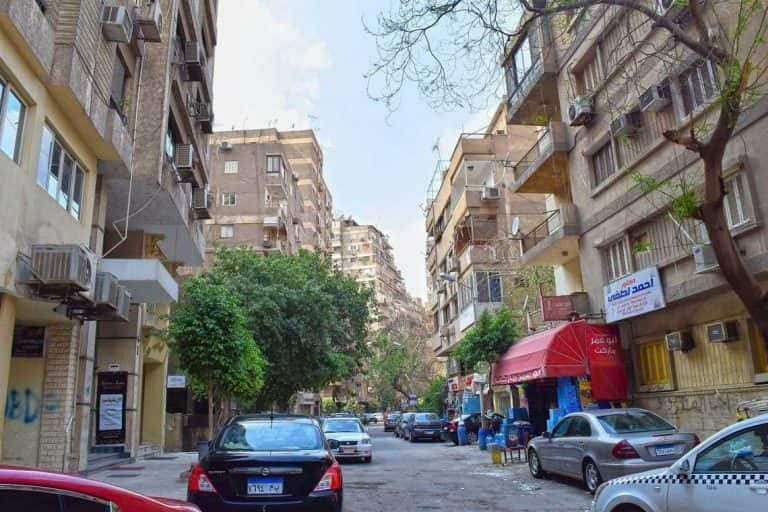 Mohandesin is considered to be one of the most prestigious and thus expensive areas in Cairo. It has two popular shopping areas, Sour Nadi el Zamalik and Platinum Mall, that attract a lot of visiting tourists from other parts of the Arab world. There are also a few major sporting clubs in the area, including Tersana, El Zamalek and The Shooting Club. There are lots of cool hangouts in Mohandesin, too. Like Bocca, a modern cafe/restaurant/shisha bar where celebrities and well-to-do foreigners (this is you) come and eat things like foreign food or fancy Egyptian snacks, while smoking something that tastes like strawberry (but will still kill you). Or Balcona, an upscale Egyptian eatery with all-night ambience you can relax in, or even just Abo Ammar El Soury, one of the best (if not the best, according to some) shawermas you can get in Cairo. Like Dokki, you can get fairly cheap apartments here, for $300-500 a month if staying medium term, or AirBnB spots for $15-25 a night for a double room. You can also opt to pay a lot more if you want! 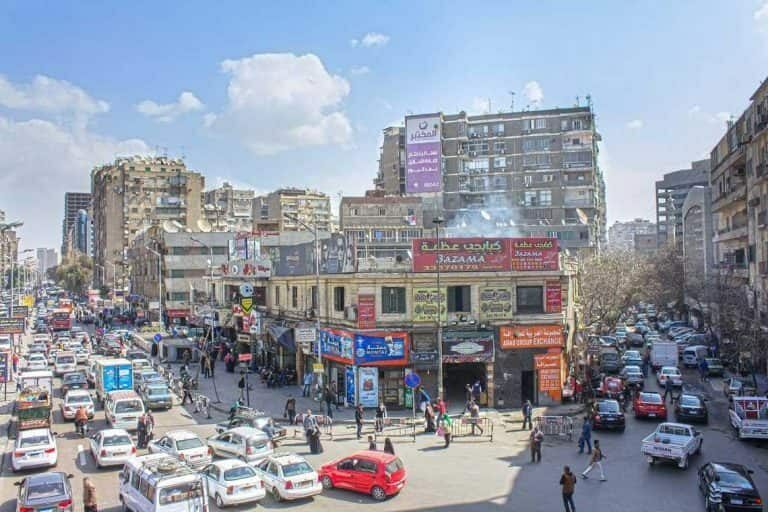 Arab League Boulevard (جامعة الدول العربية, gam9at ad-dewal al-9arabeya) is a street that cuts down the middle of central Mohandesin, and is considered to be one of Giza’s red-light districts, alongside Haram avenue. Telling you so you know not to go there. Downtown Cairo is roughly here. It’s approximate. I drew that red square. What Downtown Cairo looks like. See? Vaguely european. 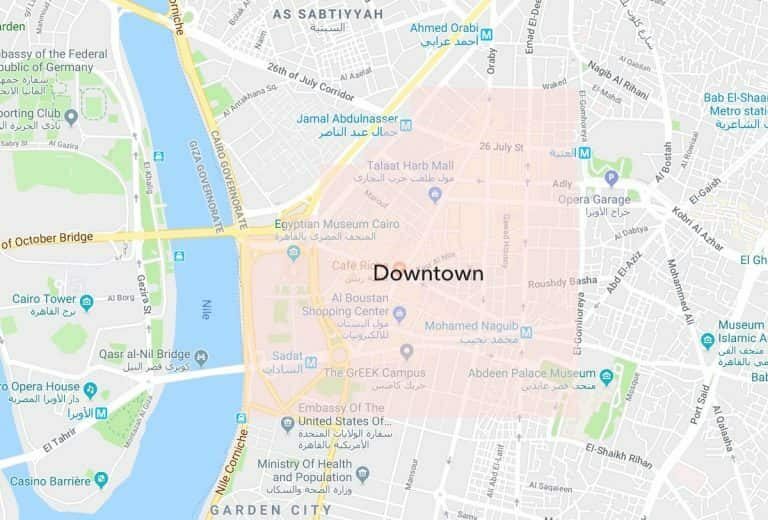 Downtown Cairo is an unofficial area just east of the Nile, inner city. 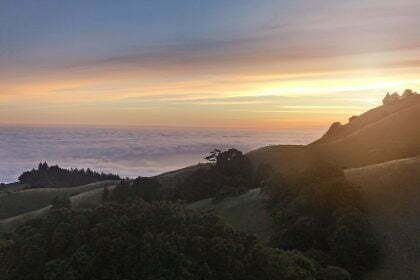 It’s a great place to stay if you’re in town for a short period, want to see the sights, but are not there to live like a local. The area used to be fancy—built by French architects over 100 years ago—but has become one of the cool spots in town. 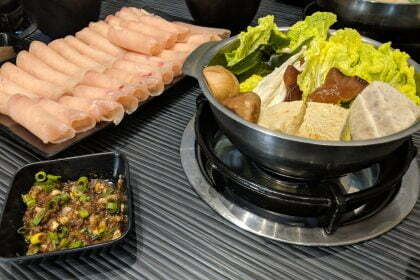 It has a huge selection of cheap eateries and places to stay. The architecture was commissioned by Khedive Ismail during his visit to Paris. He was inspired by French architecture, and wanted to build a little of it in his country’s capital, to make it the jewel of the orient. He stressed the importance of broad, linear gridded streets, geometric harmony and the introduction of European architecture. Downtown Cairo is a relic of a bygone era known as Egypt’s “belle epoque“. Unfortunately it has been neglected by landlords and tenants for decades, and many buildings are in decay. A lot of businesses moved in and opened shop, and coupled with lax regulation, this has resulted in development that hasn’t paid tribute to the aesthetics of the neighbourhood or preservation of historic buildings. Some are now in the process of redevelopment. Most of the cheap hotels/hostels in Cairo are in the Downtown district. You’re spoiled for choice, and can easily find places for US$10 a night if you want. There is a lot to see and do in Downtown. 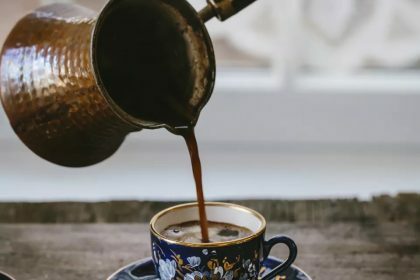 You can spend your day shopping, go to one of the iconic places to eat (like the retro Egyptian cafe Felfela for a great example of the local dish koshari, the well-known bakery Groppi or the historic cafe Cafe Riche), visit churches, mosques and synagogues, or go on a bar crawl. It’s also very close to some of Cairo’s main things to see, like Old Cairo (also known as Coptic Cairo), the Citadel of Saladin and Khan al-Khalili market. It’s also super accessible, being a two-minute drive from Tahrir Square, a 10-minute drive from Khan El-Khalili (Cairo’s most famous market) and a 15-minute drive each way from Islamic and Coptic Cairo, for a taste of both flavours. Probably the best thing we can say about Downtown is you can actually walk here! Because it’s illegal to park in most of Downtown there are no cars blocking the sidewalk and you can use your feet without going crazy, unlike most of Cairo, where straight lines are something that seemed to go extinct after the age of the Pyramids. You can visit the cafes Downtown and smoke shisha, even if you’re a foreigner, and even if you’re a foreign woman. You won’t get stares like you would in almost any other part of Cairo. Unfortunately, if you’re looking for a taste of local living, Downtown is not a place where you’ll find communities of people living, or parks or other local joints. Zamalek is actually the northern half of Gezira island, but Google Maps thinks its the whole island. It may as well be, as you can’t live in the southern bit. Zamalek is highly central, expensive, fancy and filled (relatively, compared with the rest of Cairo) with expats. Think five-star international hotels, high-end restaurants and boats on the Nile. Zamalek is a small island situated on the Nile. 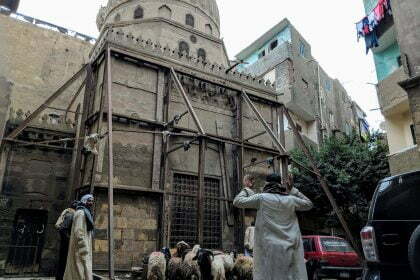 Even though this is traditional old Cairo, it has been developed quite a lot. It’s home to a huge amount of embassies and consulates, which means a lot of diplomats live here too. Zamalek is also where a large number of wealthy Egyptians and other expats live. There’s a high standard of living in Zamalek. You’ll easily find good cafes, gyms and high-end restaurants. 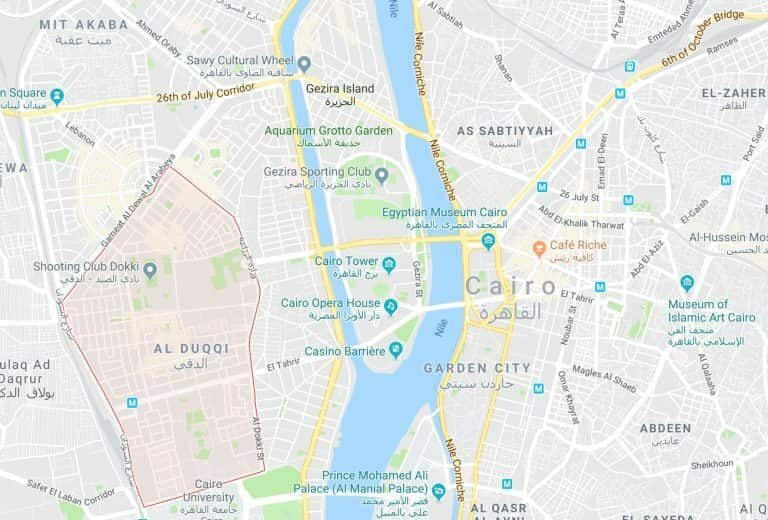 Some of the main things to see in the area include the Opera House, Cairo Tower (though we’d give this a miss), Culture Wheel, Gezira Sporting Club and some of Cairo’s best hotels. Zamalek also has a famous gym and fitness club: the Gezira Club. This is at the center of the island, and with tennis courts, a running track and a sizeable gym, it’s one of the only places in the city where one can enjoy an active lifestyle in an open area. There’s amazing nightlife in Zamalek, if that’s your thing. The hotels have clubs and bars. The one thing lacking in Zamalek is a feeling of community, even among expats, compared to places like Ma’adi. It’s high-end and a nice place to visit, but probably not a place where you can feel like you’re among regular everyday Egyptians. Map of Ma’adi area. Google Maps says it goes further east, but this is what most people mean by Ma’adi. 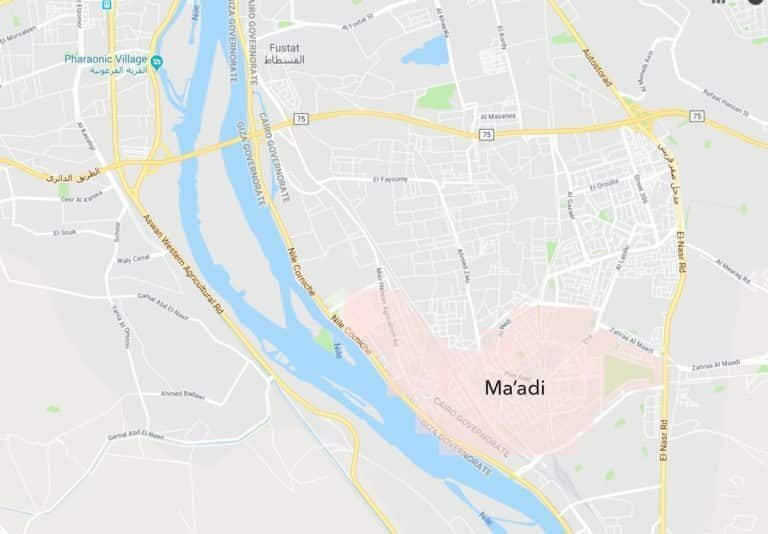 Ma’adi is another fairly affluent area that is part of old Cairo. It’s a little south of downtown Cairo. Maadi is home to a number of private international schools. 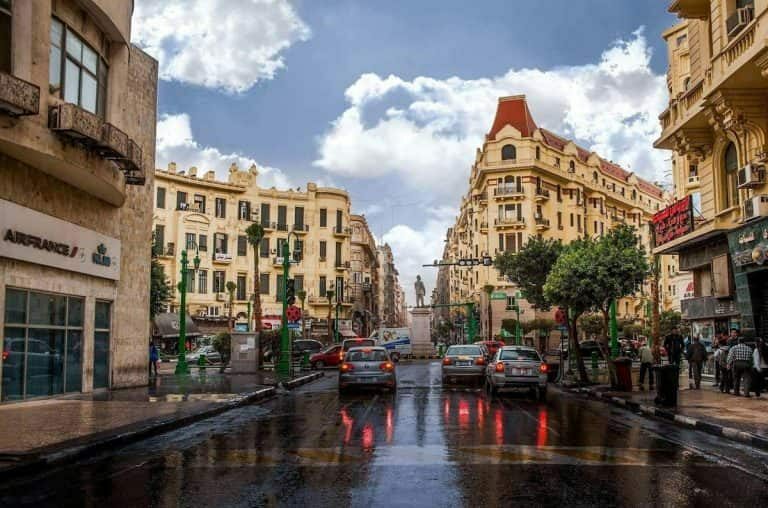 It is a popular choice for wealthy local and expat individuals and families, being as aesthetically nice as Zamalek but with much more of a residential community. Its origins as an expat neighbourhood date back to when it was originally designed, in 1905 by a retired Canadian military officer, Captain Alexander J. Adams. He set strict rules for residential development, including size of houses, property occupied by house and garden, size of sidewalks and even window shutters. 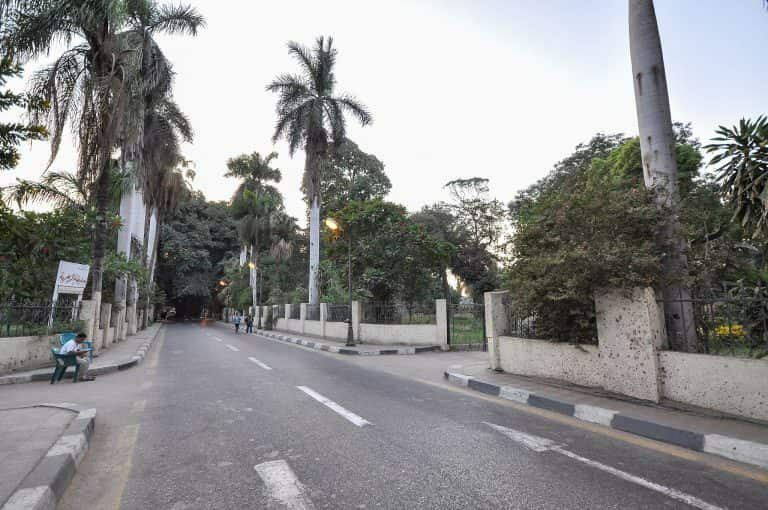 The result is the leafy neighbourhood with wide boulevards and large villas still seen in modern Maadi. 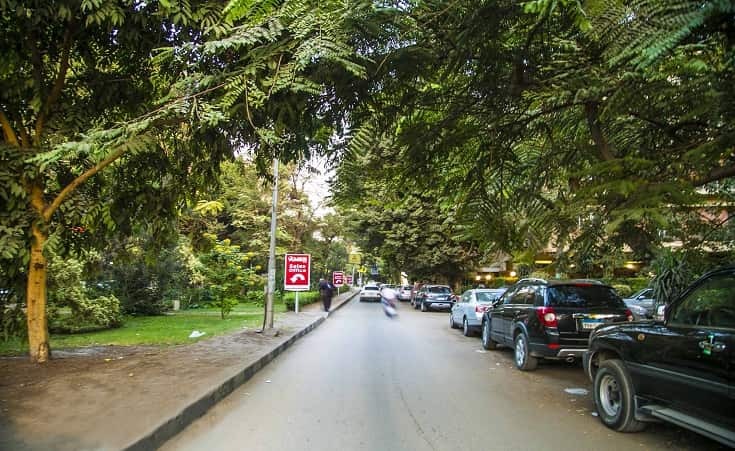 Unlike Zamalek, which is mostly about fancy hotels, embassies and diplomats, there’s much more of an expat community in Maadi, if that’s what you’re looking for (like if you’re posted there with an international company). 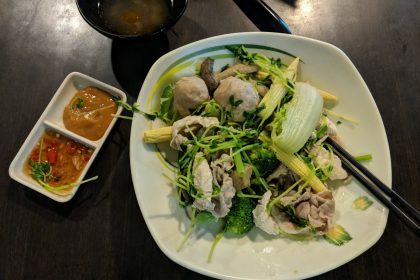 There are associations to welcome newcomer expats to the city, like the Community Service Association and the Women’s Association, which meets in the Marriott Hotel once a month. Maadi is also home to a country club which is a social hotspot for expats. Ma’adi is, like Zamalek (but unlike most parts of Cairo), quite green, and there is a less insane number of cars parked on the roads. Do they even know about double parking? Must be nice! Ma’adi is home to Al-Azhar park, which is really beautiful and worth a visit. It’s also a good location for strolling along the Nile Corniche. Maadi has a bunch of great places to eat. One of the most popular is The Platform, which is a little area on The Nile that’s home to a diverse array of international restaurants, and which gives you enough diversity to visit a few times. Generally, we wouldn’t recommend you stay in Greater Cairo unless you are staying longer term, want to just visit the Pyramids (see the section on Giza) or are staying for a particular reason, like visiting your company HQ somewhere. 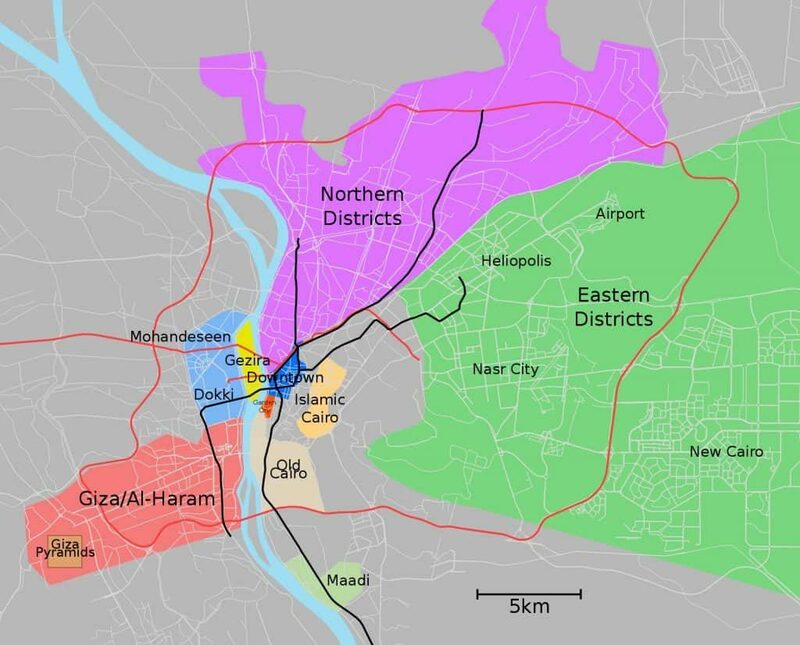 These areas are much more suburban, not much cheaper and congestion can prevent you from getting around Cairo to where your friends have chosen to hang out… unless they’re all hanging out in Heliopolis (something Heliopolis residents still dream about). 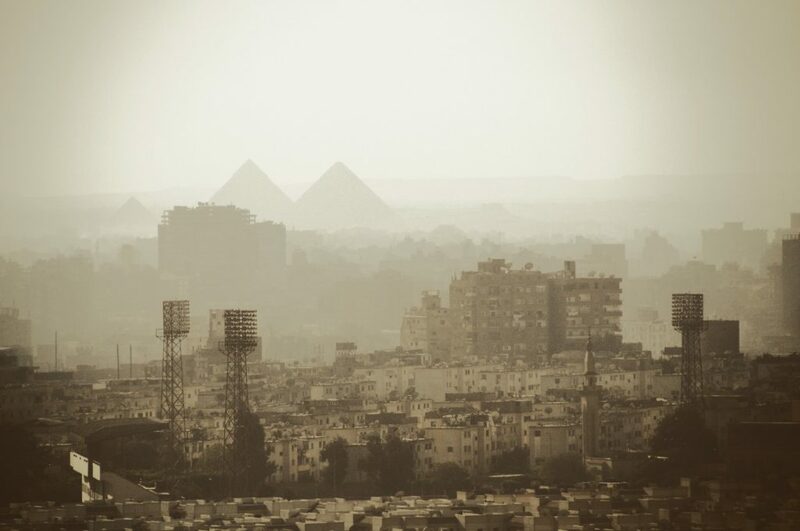 If you have a personal view on staying in Greater Cairo, let us know and we’ll update our site. You might have heard of “The Pyramids of Giza”. Well, this is that area. Giza is actually the whole area west of the Nile – in other words, Cairo is technically east of the Nile and Giza isn’t part of it (see Wikipedia where it’s described as a separate city). That said, Giza has been absorbed by the growing mass of Greater Cairo, and parts of it are more central to Cairo than other parts of greater Cairo proper. Aside from Dokki and Mohandesin near the center, Giza is known for housing the Pyramids. 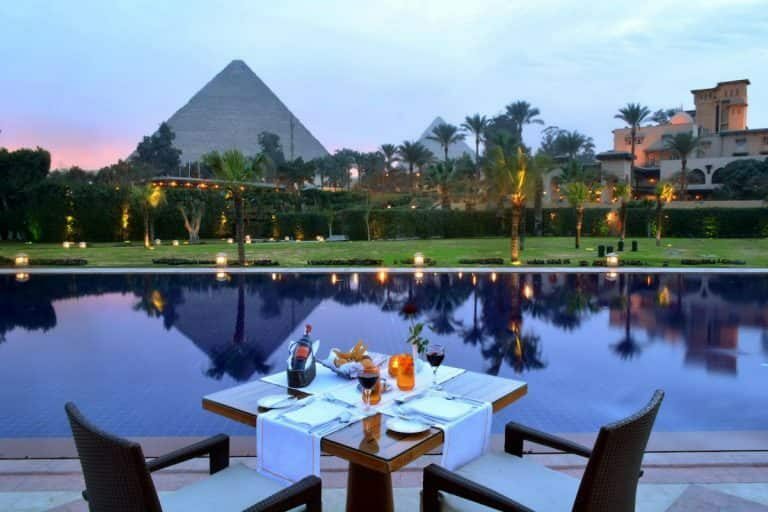 If you’re travelling for a short period of time, you can opt to get a hotel out near the pyramids and see them at sunset or wake up to views of them in the morning. Pretty magical. Rooms with views of the pyramids are typically US$2-300 a night, but this is still cheaper than equivalent rooms in downtown international hotels. So instead of booking a room, just book a table for breakfast or an evening meal or drink. Bam! View from Marriott Mena House. This view is free with your expensive food and drink. Heliopolis is a suburb that once was outside Cairo, but which has merged with Cairo as the city expanded. It was established in 1905 by a Belgian industrialist who bought a huge swathe of land and developed it into a city in cooperation with son of the Egyptian Prime Minister at the time. Heliopolis is proud of its unique architectural style, which was actually invented in the suburb and is now known as the “Heliopolis Style“. The most classic example of this style is the Heliopolis Palace, built in 1910 as the Heliopolis Palace Hotel, but now repurposed for use by the President of Egypt. But other buildings around the area also recall the style well. It’s one of the more affluent areas of Cairo, despite not being near the city center. Lots of celebrities, soccer players, politicians and wealthy families live there. It’s linked to the rest of Cairo and to airports by the metro system. Heliopolis is a nice place to live. It has organised streets, being a relatively well-planned part of the city, though they can be as busy as anywhere else in Cairo. There’s a lot to do in Heliopolis, but mostly stuff that’s only important if you live there. For example, there’s the Heliopolis Club, one of the fancier sporting/recreational clubs around Cairo, as well as a number of other clubs. It houses the main headquarters of the Egyptian Army and the Egyptian Air Force, as well as Cairo International Airport. Heliopolis, in case you’re interested, is a word of Greek origin that means “City of the Sun”. 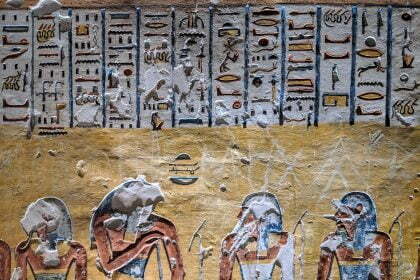 The sun was deified in both Greek and Egyptian mythology, but the pronunciation of the name of the city in the Ancient Egyptian language has not survived, as it’s recorded only as the equivalent of “lwnw”, vowels not being recorded in the old language. New Cairo City was established to combat the urban sprawl of the rest of Cairo, which has become overpopulated and congested. It’s home not only to wealthier Egyptians but to many expats as well, with a total population of five million. This is where you’d go if you you were visiting one of the many international companies headquartered in the area, or visiting a high-end mall like Cairo Festival City (a mall so big it includes its own apartment district). The malls are home to lots of the nicest restaurants in Cairo. Wealthy and expat families have set up in New Cairo. There are lots of schools there, including the American International School, Cairo English School and the Canadian International School of Egypt. It’s also home to the American University of Cairo, one of the best universities in the country. The 6th of October (مدينة السادس من أكتوبر‎, madiinat as-saadis min uktobar) region is, like New Cairo, almost a city unto itself, with around 20 universities and education institutes (both local and foreign), schools, huge supermarkets, hospitals and so on. It’s newer than New Cairo (I know, why didn’t they call it New New Cairo? Opportunity lost), so it doesn’t have as many amenities, but it’s still super fancy. 6th of October is, so far, a fairly industrial place. It’s home to a lot of companies that have set up in Cairo, like Bavarian Auto Group and General Motors. There are schools nearby, for families who are setting up, including the Heritage International School and the British International School. 6th of October also contains Smart Village, a huge corporate compound in Cairo. Why is it called “6th of October”? The answer is not just interesting, it might be a factor in whether you want to stay there. The city was established in 1979 and commemorates Egypt’s role in the 6th of October war (known in Israel as the Yom Kippur War). A brief summary of the war is that on the 6th of October, 1973 (the eve of Yom Kippur, the holiest day in the Jewish calendar, on that year occurring during the month of Ramadan), Egypt crosed the Suez Canal, advancing into the Sinai Peninsula. Syria conducted a co-ordinated attack on the Golan Heights. Within three days Israel had mobilized most of its forces and halted the Egyptian offensive, resulting in a stalemate, and had also pushed Syria back to pre-war ceasefire lines. Israel then launched counter-attacks, first on Syria, and then on Egypt. By October 24, Israel had completely encircled Egypt’s Third Army and the city of Suez, was within 100km of Cairo and within 40km of Damascus. The UN imposed their final, binding ceasefire on October 25. The outcomes of the 6th of October/Yom Kippur war were significant. The beginning of the conflict was the first time in decades that they had any military advantage over Israel. The negotiations resulted in Israel ceding Sinai to Egypt (it had previously been captured during the 6-Day War in 1967). Finally, it was the first time an Arab state had recognized teh state of Israel during a negotiation. … chaotic, mismanaged, congested with vehicular traffic in the absence of an effective public transport network, and the district’s density continues to escalate as low-rise residential buildings have long disappeared to give way to speculative apartment towers by developers. Probably not your first choice. But still, millions live there. There are many services (plenty of supermarkets, gyms and places to eat). It is home to City Stars, the largest mall in Egypt, and one of the biggest in the Middle East (Dubai provides some tough competition). That’s symbolic of what you’ll find in Nasr City. Malls, theme parks, large attractions like ice skating rinks, parks and mega stores. Not really the right place for street food or local eateries, but they do exist. Finally, you can get AirBnBs there pretty cheaply (entire apartments for $10-20 a night), so don’t rule it out.